Nellie and Pintle, High Netherma and Maston; Metalstones, Archie and Popple scars. “The names go back a terrible long time,” Ronnie Porter tells me. They’re part of the oral tradition of the shore, and neither Ronnie nor his wife know how they should be written. 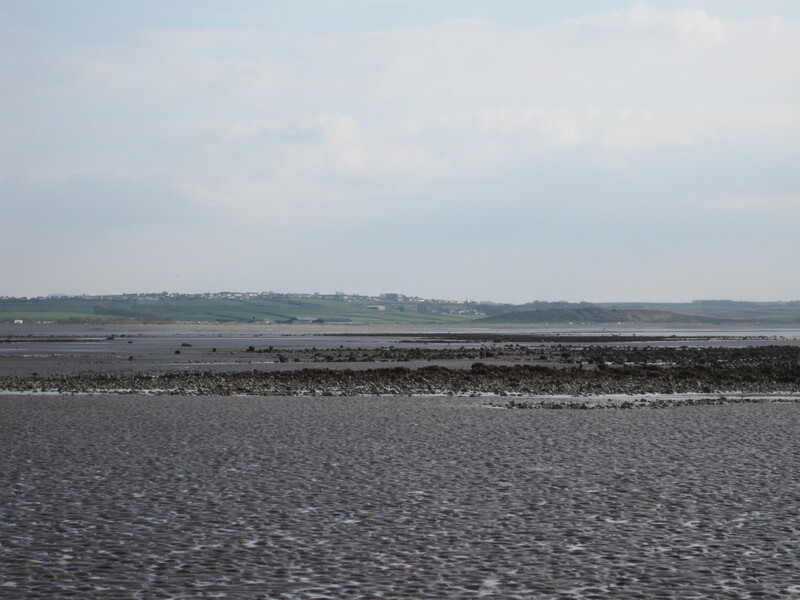 There’s been a long tradition of fishing for fish and shellfish from the Allonby shore, with fixed nets, fixed and baited lines, fixed lobster-pots, or with hand-held nets or rods or rakes. 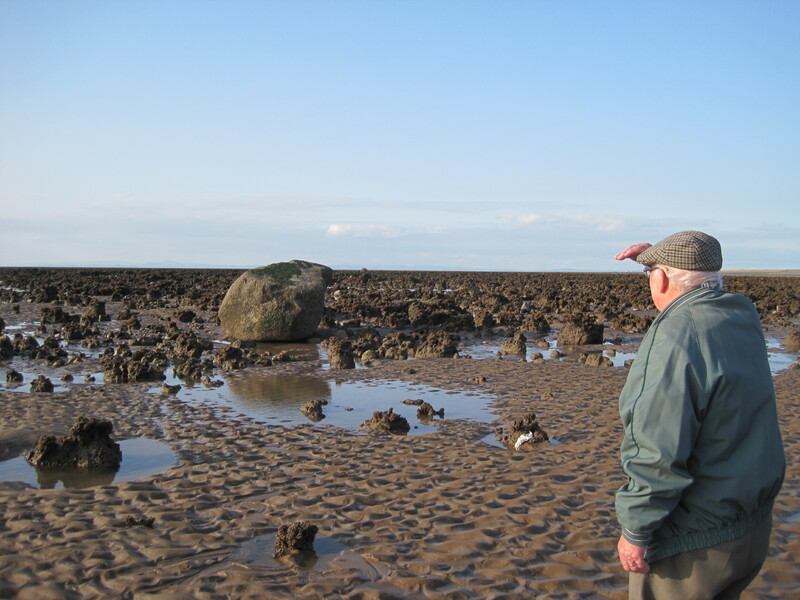 Ronnie has done most of these, having helped his father and grandfather in the days when the herring shoaled and spawned in the bay, and he is one of the very few people remaining who know the names of the rocky outcrops and big boulders that line the lower shore of Allonby Bay. From the upstairs windows of his house just above the beach he sees how the profiles of the sands and rocky outcrops continually change, by the day, the week, the season and throughout the years. “In the ‘50s, the sea came right up to the front wall of this house, there wasn’t a bank,” he told me. 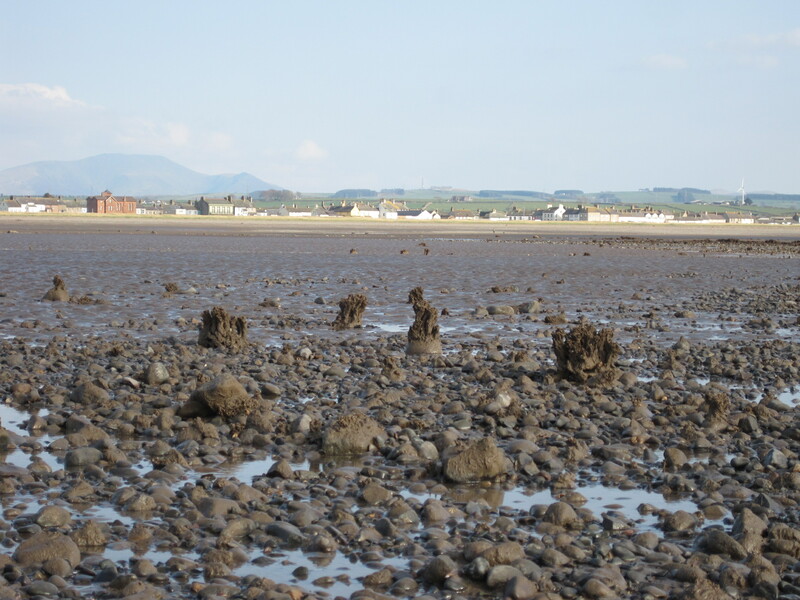 “You could see right onto the shore.” (For a picture of the proximity of the sea to the houses, see the ‘Hobbling through Allonby‘ post.) Then in the 1960s, the council built sea-defences of sandstone blocks and banks between the village and the shore. “There were grazing rights on the banks. The council put up a fence – grass grew, marram grew and caught the sand.” Now he has to go upstairs to see the sea. 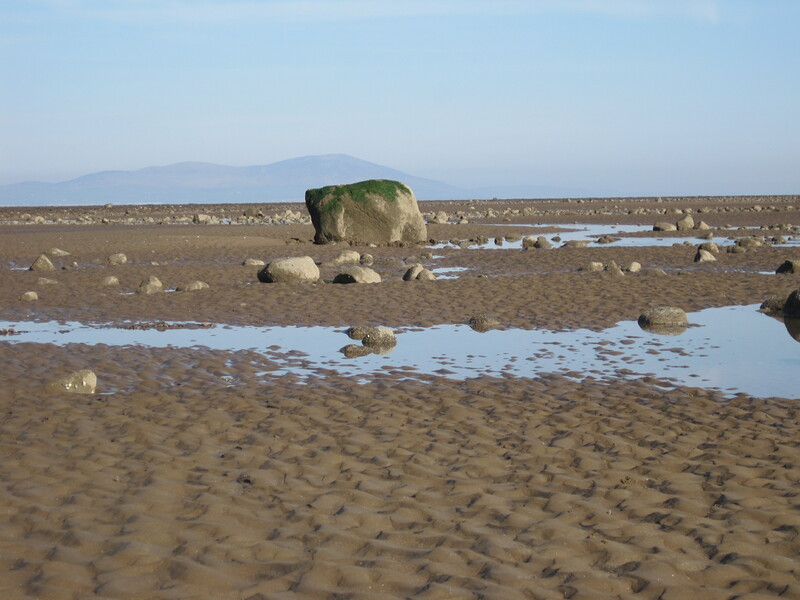 These “big tides” and the storms shift the sand, revealing and hiding the scars; sometimes the big boulders are exposed to their bases, at other times only their tops may show. Now, below the village, it’s obvious, as Ronnie says, that “the sand has gone off the shore, there are lots of extra scars. The gravel bank is moving north-west, and there’s a hollow behind it.” Not long ago he found a line of clay fishing-weights lying amongst newly-exposed gravel. 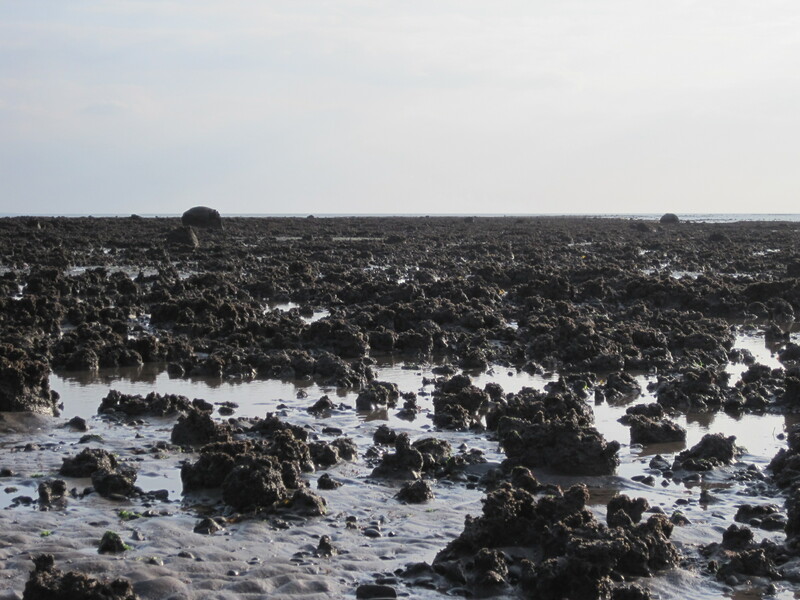 We had planned a month ago to walk along the shore at low tide, but a Low Pressure area and a fierce strong wind had kept the tide high on the shore and only the very top of High Netherma was peeping out. But last week the low-tide conditions were perfect for an evening walk, with calm water and long soft shadows picking out the relief. The rocks seem to shape-shift and change in size depending on where you walk or stand: looking from the dunes or the road, you think you understand their topography. From a hollow on the shore, the scars merge confusingly, only to reappear as individuals when you climb onto one of the domes of sand that have formed stationary waves along the shore. Yet there are obvious markers such as the huge square Maston, down below the end of the Edderstone Road and inshore from the scar called Archie; and Hanging Stone at the edge of Dubmill Scar. I stand still and look back towards the village, to the southern end of East Sands, down towards Crosscanonby and the Milefortlet on its little hill, and I repeat the names out loud, trying to fix them in my mind. Popple – below the village, and of which more has been exposed this year. The two boulders, High and Low Netherma (because they’re visible at high and low water). Then the scar called Metalstones. “No, that’s Matta.” It’s slightly higher than Metalstones, the reefs forms ridges. We clamber across the “coral”, and reach the far edge of Archie, by the broad swathe of firm and rippled sand. Stretching way out into the Firth are two long lines of rock, Hill (“it’s difficult to get to, and you don’t have much time there”) and Far Hill. But we can cross the sand to the The Squash at the edge of Dubmill Scar, and on the way I pat the great Hanging Stone, which I myself so often use as a marker for my ‘Dubmill shorewalk’. This year it stands proud and fully-exposed, its top scarfed in green weed. We stand still for a while to enjoy the peace and soft light of the evening, listening to a curlew and oystercatchers; watching a heron wade into a pool up to its chest then pose, motionless, neck curved. Further North beyond Dubmill are The Shotts, Number 1 and Number 2; and Crinla Lake and the Coving Stone, with Whitestone Gate (marked by a whitish boulder); and Point of Tail scar which goes out into the Firth from Crinla. On the way back to the village Ronnie shows me the keel of an ancient shipwreck on Ship’s-Keel Scar. Encrusted with marine life, it is scarred by the sharp-edged, wide cuts of hack-saws as people have attempted to extract copper nails. What’s the story of the wreck? 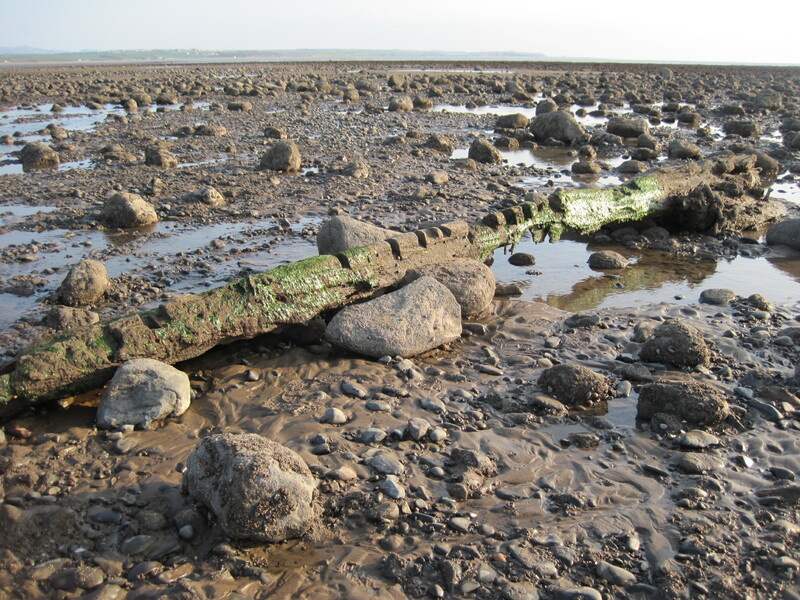 No-one seems to know, it’s part of the oral history of the shore that has been forgotten. 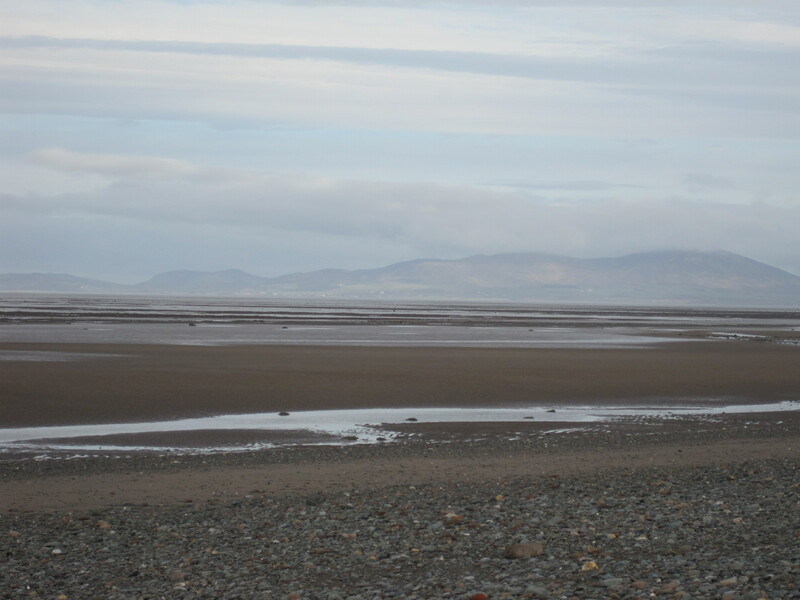 This entry was posted in Allonby, fishing, stones and tagged boulders, fishing nets, rocky scars, Romans, shipwreck. Bookmark the permalink.